To revive downtown, the city appears poised to drive right through a masterpiece. 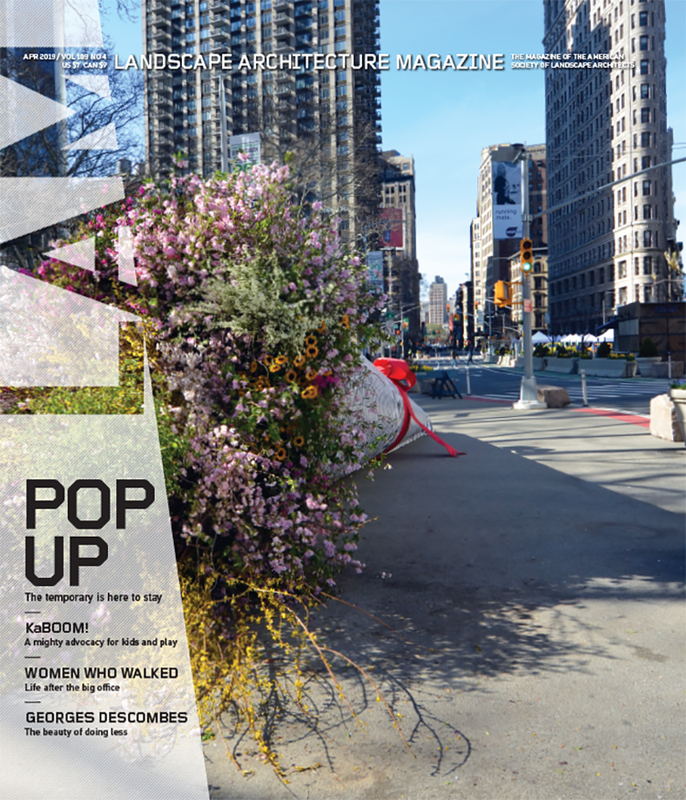 From the December 2014 issue of Landscape Architecture Magazine. The city of Fresno sits in the middle of California’s San Joaquin Valley. When you drive into town from Los Angeles, the landscape is agricultural and framed by roadside eucalyptus trees. It gives way to off-ramp clusters of gas stations, fast-food chains, and light industrial warehouses. Most of Fresno’s neighborhoods, after nearly 50 years of decentralization and flight from the urban core, sprawl north, tracking the edge of the San Joaquin River. The city’s historic downtown and civic center are a near ghost town. At the heart of downtown is the Fulton Mall. In the early part of the 20th century, it was Fresno’s main drag, Fulton Street, six blocks lined with banks and department stores. 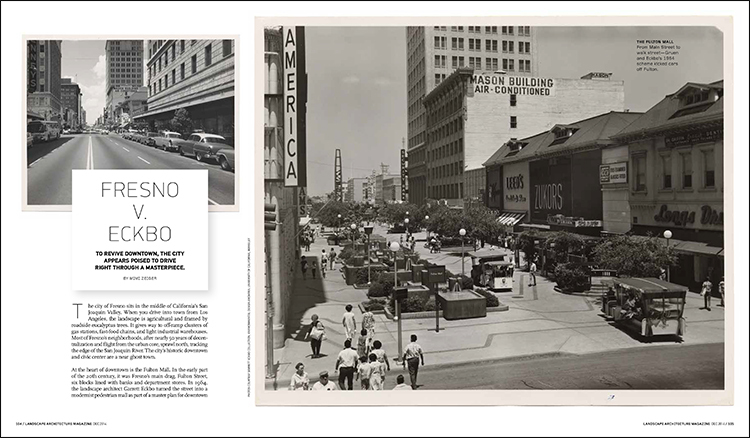 In 1964, the landscape architect Garrett Eckbo turned the street into a modernist pedestrian mall as part of a master plan for downtown Fresno by Victor Gruen Associates. Photographs of the period show a wide promenade full of people flanked by the awnings of existing buildings. Daffodils peek out of Eckbo’s sculptural planting beds, fountains gurgle, and a clock tower by Jan de Swart, an expressive interpretation of a historic form, unambiguously marks the mall as the new town square. Today, the mall is the center of a fight over downtown Fresno’s redevelopment. The city government, with a $14 million federal transportation grant, supports plans to put a new complete street down the center of the mall. Preservationists plan to file a lawsuit to block the scheme. The rhetorical standoff between sides comes down to revive versus destroy, but the conditions on the ground tell a more complicated story about the role of design as a catalyst and a scapegoat in a changing urban landscape.